The Online Photographer: So, What's In Your (Digital) Wallet? So, What's In Your (Digital) Wallet? My last column, on the possible merits and drawbacks of the MacBook Air, raised an interesting question in my mind. How much storage space do folks really need for photographs on their trips? I mean actual demands for storage, as opposed to hypothetical exercises based on multiplying file sizes by some imagined number of photographs one might take. Here's what I found looking at four recent trips whose photos are stored on my hard drive. (By way of background, I'm using a Fuji FinePix S6000. This is a 6-megapixel camera that generates 13 MB RAW files that yield 35 MB 16-bit PSD files.) A photography-oriented vacation on the Oregon coast lasted about nine days. The folder for that trip weighs in at a little under 8 GB. There are some days where I generated 2+ gigabytes worth of photographs, but there were many more days where I produced less than a gigabyte. 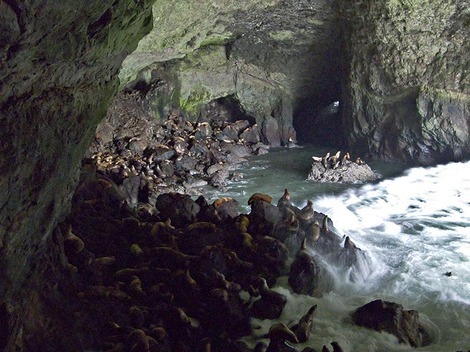 Sea Lion Cave, on the Oregon Coast, is an amazing place. Prepare to make lots of photographs... and be deafened. Those beasties never shut up! Was this trip atypical? Looking at three other fall trips, it seems not. A five-day trip to Alaska produced 4.5 GB of files (including one huge synthesized panorama running some 750 MB). Three days in upstate New York got me a little over 3 GB of files. Six days split between New York and Minneapolis came in at just about 3 GB. Days when I made a lot of photographs produced larger folders, but not by as much as I would've thought. On such days, most of my free time in the evening was spent sorting and winnowing the images I'd made. On days when I made only a few photographs, I had more time to work on them in Photoshop, so there were fewer files but more larger ones from those days. It looks like I typically need 1 GB of storage for each day of a trip. If I want to err on the very safe side, I'd double that to 2 GB per day. If I went out and bought a nice high-end DSLR with twice the number of pixels, 4 GB per day would give me ample safety margin. I'd like to hear what kind of numbers readers come up with for themselves. Let me emphasize that what I'm looking for here is actual, historical experience, not theorizing. Look at your last several trips, photography-dedicated or otherwise, and let us know what you find out. Featured Comment by John Camp: "I was embedded with a helicopter company in Iraq in January and shot 5.3 gigs of Nikon D3 raw (12.1 megs each) in nine days. I am primarily a writer and the photographer who was with me shot about 4X as much. "I took 32 gigs of CF cards with me and kept the images on the cards, as well as backed up in my laptop. Flash memory is now so cheap that I plan to buy a few hundred dollars more of 4-gig cards, and use the cards themselves as my primary storage and backup, like rolls of film. With the D3 I can shoot simultaneously to both cards, and use the camera to confirm that they're there. "I'm reluctant to use cards bigger than 4 gigs because too much is at risk if something goes wrong. This may be a fantasy, but I worry about things like a possible electronic or static fault in the camera that damages both cards simultaneously. I never actually filled a card—the 5.3 gigs I used was spread of three 4-gig cards." Interesting.... Well personally I'll definitely need around a GB daily... but it's so easy to back everything up. A GB a day is easily manageable. As a commercial location photographer, my needs are somewhat more robust. I typically shoot between 10-15gb per day on two 5Ds, and I have had as many as 10 such days on a single road trip. I often have to strip the laptop of the images during a trip, which is always mildly alarming. I travel with four portable USB hard drives, and I don't clear my cards and go to bed until the data is on two of them. Those drives are always in different locations when I'm on the move, say, one in checked luggage and one in the camera bag. If I'm feeling especially paranoid and I have a free day during a trip, I'll burn the lot onto DVDs and FedEx them home. Trip 3 was with a 1ds3, average size = 28meg per shot, so 60gig, 63gig and 34gig respectively. These were all 'repeatable' trips, so I loaded to a hyperdrive, but no backup. If the trip was 'expensive' then 2x for backup. Jeff Schewe on a trip to Antarctica noted over 20 days, 200 gig, just under 16,000 images. I don't believe that included backup. I am keeping my fingers crossed that I never need to get a different wallet. Try as I might, I can't get used to pulling the trigger and even then I often edit by deleting on the card. So with a NEF at 15MB, I rarely come home with more than 300MB. And I junk about half of those when I get home and start processing. If it is something special (a street demonstration would be a good example) I might take 60 shots, giving 900MB. I still junk a lot when I get home. As for processing, I keep the NEFs of course. I used to save layered PSDs, but now I save as a jpeg. I figure that if at some time in the future I didn't like what I did, I will start again from scratch. And the jpegs are 5MB or around that. Ctein, I spent 2 months on the road last year from Maine to California and back, hitting a few dozen hot spots. Shot some J Pegs with my Sony 828 and Raw with the 1Ds. Ended up with 30 Gigs of images. Had they all been Raw it could have been doubled that. but thats still only 1 gig/day on the average. I still burn DVD's of everything and save to a second hard drive. So the bottom line is, a laptop is still necessary and I also work on images when there is nothing else going on. Of all the trips my wife and I have taken putting 60,000+ miles on the RV going to Newfoundland,and through Canada and around the US. 1 gig is about the average days worth of shooting. I may have shot more if I had bigger cards and the 1Ds eats batteries. I now have a 40D and an 8 gig card. So I may hit 2 to 4 gigs/day this year all raw, Thats going to be a lot of DVD's. 1GB per day is about what I average too. A trip to Patagonia last year produced 20GB in about 20 days, I was expecting more based on being able to fill a 2GB card in an afternoon quite easily... but you can't keep that up, your eyes get tired of looking. Speaking of personal photography only, at a little over 10 megs/raw file, a big day for me is about a 1-gig day. Now that would probably include a few exposures of certain subjects, to be sure of capturing vegetation movement for example, or variations of where the pedestrians are. If I'm away from home, it would be unusual to have 2 of those days in a row. So the average is always below 1 gig/day, but 1 gig is what I plan for. I use mostly 4-gig cards and bring one more than I think I'll need. Right now I'm eleven months into an 18 month trip. I've got a macbook with an 80 gig hard drive, of which roughly half that is taken up by music, my girlfriends photos and other various flotsam. I shoot in RAW with a 400d, and periodically go through my shots, delete the ones I don't want, delete the layered PSDs and delete the Capture One settings files (which take up huge amounts of room). I only do this once everything has been burnt onto two DVD's, and one of the discs is posted home (I've sent around 20 home so far). It's a constant battle for free space on my computer, and I think that things would have been much easier had I elected to pay extra for a larger hard drive! I'm an amateur photographer using D300 shooting NEF or NEF+JPG. I just returned from a one month vacation. I needed about 60 GB for images + mail etc. on the laptop. I make backups on two WD Passport drives. That's about 2 GB/day. Last year, on a 2 1/2 month trip, I used 1 to 1.5 GB/day (D200 NEF only). I don't cull images until I return home, so keep everything during the trip. Using a 10mp camera and saving as RAW and highest quality JPEG, between 1 and 2 Gb per day is enough for me. That's not much by today's standards but I can't see the point in taking hundreds of photos of crap. On a weekend trip (usually to somewhere new on a one-off) I shoot a lot. Maybe 150 shots a day, about 7MB each (8MP RAW from a Canon 20D). That means I use about 2-3 2GB cards over 2-3 days. Sometimes I don't bother with back-up and never wipe the cards until I'm home. On a longer trip (7 days or more) I typically shoot an average of 80-90 shots a day. 2GB every 2-3 days. I use a single 40GB hard-drive and reformat each card when I've transferred. Most I've ever shot in one day was 650shots (about 6GB), that was the day the Tour de France came to town. Of course, if I change camera that'll be a world of grief as the RAW files are getting bigger and bigger with more and more MP. I wish the fact that the price of memory is coming down would mean I paid out less cash rather than needing more. On a 2-week Mediterranean cruise last year, I shot 2.5GB total. So less than 200MB per day average. My biggest day was 450MB. How? Fewer files and smaller files. Fewer files because I value quality rather than quantity. I take photos that have promise and pass on the ones that don't. And I almost never use burst mode. Smaller files because my camera is 8 Megapixels, because I capture in JPEG rather than Raw, and because my JPEG capture is at Canon's "Normal" quality setting rather than "Fine". For me it's not about saving space—it's about saving my time. Fewer GB to download, fewer GB to back up, no post-processing, fewer images to sort through, fewer images to annotate and catalog. I average about 1Gb images per day on a trip using a 6Mp Nikon D100. I carry two 1Gb CF cards, each of which holds 102 NEF files. Most days the 1st card is nearly full and occasionally I'm reaching for the second card for the last few shots at the end of the day. I copy the CF cards to my laptop HDD and then backup that to a USB HDD each evening. A different take: my hard limit per day used to be less than 1Gb; nowadays the hard limit is 2Gb. Reason is, I used to have a 1Gb memory card as the main card, while nowadays it's a 2Gb one. And yes, I have more cards, but it's a minor hassle to switch and to keep organized. Minor hassle, but evidently enough that I subconsciously strive to keep within the limits of the card I have in use. I almost never switch cards in practice. "A photography-oriented vacation on the Oregon coast lasted about nine days. The folder for that trip weighs in at a little under 8 GB." When I was in Istanbul last summer, the whole of the photography part lasted, all together, around six hours. I filled 7 gigabytes. Yeah, I clicked like crazy, but I wanted to be use the available time as much as I can. OTOH, two week-long trips back to my hometown gave me around 2-3GB each. And that's mainly because I went for trips to a national park. Everything shot in RAW, ca 10 and 13MB per image, depending on the camera. Developed in ACR and saved as 16-bit files, 50-80MB. And yesterday I installed a new 250GB disk in my computer. 13gb of RAW from an Olympus E-400 for a week in Germany, all downloaded onto a PSD. I shoot a number of shots approximately equivalent to about 5 rolls of film at any given event. Which generally leaves me needing about 180 frames (~ 5 x 36). Which currently works out to 2GB of CF. I imagine if I was travelling I'd probably take the same as a guideline for how much storage I'd need per day. I went for a day out last week just taking snap shots with my 5D and ended up taking 1.8Gb worth of images. On assignment well that figure can go up to 12 - 14 Gb, I always carry 16Gb worth of CF cards and my Epson P2000. I'm just glad the cost of memory has become so cheap. over the course of a whole year I average to about 2gb a day (365 days), so really not so much. On a recent trip that included one full day and three half days of shooting, I made a total of around 300 exposures. At 6MP RAW (5.19 MB each) that comes out to just over 1.5 GB. A 2GB card lives in my camera and it is very rare that I have to change cards before the end of a day. Having just returned from four weeks in Mexico, I've found that I shot about 1500 photos with my D70, about half in the first three weeks, and the other half in the last ten days. This isn't surprising, as I was at a quiet spa for the first bit, and was in bustling, colourful Oaxaca for the last week. Storage is a going concern. Since my main machine is a laptop, I'm constantly shuffling between external drives to keep things online and backed up. I still dream of having a half-terabyte drive in my laptop. My pragmatic side tells me that by the time this happens, I'll be needing something 10x bigger. It never ends, does it? low. I was recently caught in a fast-moving situation with only my G7 and a 2gig card,which i filled to capacity in just under 2 hours. Last August my wife and I went to Iceland. I was using two cameras; the d200 and my IR converted D70; she had a D40. She made rather fewer exposures than I did. On the 11 day trip we managed to fill 90 GB between us. On that trip -- we mostly camped -- storage wasn't so much the problem as electricity. Next time I do a trip like that I'm getting a car inverter. Lately I travel with 4x5", and depending on how much time is for photography and how much is for other purposes, I shoot around 50 sheets of B&W film a week. I store my exposed film in a box (one box for each emulsion type--usually two types) with five tabbed dividers that I can feel in the dark to separate the sheets according to contrast range, and I usually have another box for sheets to be processed in a high speed developer. If I carry color as well, that's another box, or I may use a rollfilm back for color. If I travel long enough to fill up a box of film for processing, then I'm also emptying boxes of fresh film that can then be used to hold exposed film. From James Agee A way of seing: >Well used, the camera is unique in its power to develop and to delight our ability to see. Ill or indifferently used, it is unique in its power to defile and to destroy that ability. It is clear enough by now to most people, that "the camera never lies" is a foolish saying. Yet it is doubtful whether most people realize how extraordinarily slippery a liar the camera is. The camera Is just a machine, which records with impressive and as a rule very cruel faithfulness, precisely what is in the eye, mind, spirit, and skill of its operator to make it record. Since relatively few of its operators are notably well endowed in any of these respects, save perhaps in technical skill, the results are, generally, disheartening. It is probably well on the conservative side to estimate that during the past ten to fifteen years the camera has destroyed a thousand pairs of eyes, corrupted ten thousand, and seriously deceived a hundred thousand, for every one pair that it has opened, and taught. YOU COUNT IMAGES BY BYTES ? Shouldn't you rather count the number of keepers? 1 GB/day seems to be about right for me too, whether at home or traveling. Lightroom tells me I shot about 13,000 images in 2007. Maybe a couple hundred are good enough to say I really like them though. But I wanted to comment on people backing up to DVD and deleting originals. I'm surprised people still do that as certainly for me over the years DVDs have proven to be very unreliable. I have lots and lots and when I go back to one it's inevitable that some portion is inaccessible. Starting a couple years back I made a point to have copies always on hard disk as well, and nowadays I don't bother with DVD as I find it better to take the good ones and archive them online. DVDs are prone to loss, theft, damage and rarely can be counted on over time so just in people thought they were the best I wanted to make a note here. I was in Ethiopia for 49 days and Morocco for another 7, as well as a few odd days in Germany in Luxembourg. All-in-all, I rpoduced about 80GB of Raw + JPEG files using my Rebel XTi (I turned off JPEG halfway through, as it was taking up too much space. These shooting numbers were constrained by needing to work (it was a research trip) and by two equipment failures, which required that I ration my shooting for a couple weeks. Managing digital files on the move sounds like a whole lot more work than managing film. Like David G., I shoot 4x5 as often as I can when travelling. Since I mostly use Quickloads, any post-shooting work is limited to sorting out the 'A' and 'B' sheets and then storing both separately in my luggage. If I'm away for a while, I'll mail exposed film home. on a three month stay in indonesia, where photography was a sideline, with the 20d: over 100gb of files. on a 2 week (counting flying) vacation to france where photography occupied more of my time, using one 5d: about 35gb of raw files. on a 3 day weekend to the coast, not just for photography, about 12gb. i delete completely botched mistakes, but hesitate to delete everything else. many times i have gone back and found something, or someone, interesting in a photo hitherto overlooked. in an ordinary given month (no special trips), i may take 1,500~4,000 images; of those, probably 100-200 are actually worth keeping, and 0-5 are actually good. i agree with another poster who noted that photos of people doing things take a lot more frames. Like a lot of other people, I tend to average about 1GB per day when I'm shooting. That's shooting in PEF raw format, which are around 9-10MB per image. "Managing digital files on the move sounds like a whole lot more work than managing film." Sure seems that way to me too, on the rare occasions when I travel. Personal shooting and professional work are two different heads for me. My pro work is typically covering performances, events and doing picture stories of people in their environment. Since these are one time only happenings that are not subject to being re-shot, I tend to shoot steadily but judiciously until I get the moment. My use varies widely from as much as 24 gigs in a day to as little as 1 or 2. Depending on the situation I may deliver as much as 80 - 90 % of what I shoot to as little as 10%. It's all according to what is needed based on the situation. On the road, everything gets backed up on 2 WD drives. Personal work is all done on 120 color neg film. Over a 3 month period last summer I spent 10 days shooting a project. I shot about 97 rolls and came away with 75 images that I really liked, which when scanned takes up about 80 gb of drive space. I averaged 1-2 GB per day on a trip to Germany and the Czech Republic last fall (~8 MB raw images from an 8 MP camera). I didn't spend a lot of time managing the images. I copied each compact flash card onto a Digital Foci Photo Safe at the end of the day, and every couple of days copied the new folders onto my wife's laptop (she was working the first part of the trip). If I were doing it again, I would consider buying another Digital Foci for backup and just use that. The only trouble I've had with it in the six months I've had it has been when I filled it up using it as an external hard drive. I like about 6 of the shots. I return each film cannister to its plastic container and store them in a Zip-Loc plastic bag. What happens if you lose the film? If one have copies on 2 portable HDDs, DVDs and possibly a laptop, it would be difficult to lose it all, short of a major catastrophe. First of all the mac-air is not expecially suited for "on-trip" photogrpahy purposes, the only thing it has is the weight (slightly) and the width. When traveling I take my macbook pro and am confident that it is able to run aperture and CS3 at acceptable speed, with a macair I doubt if it will run anything "chunky" smoothly. But to answer your question I will shoot an average of 100 Raws at 12mb per travel day, I try to organize them once a day/every 2 days to avoid a mass of clutter at the end of a trip. Out of the 100 average shots I will keep 50 of which eventually 5 or so will be 5 star shots 10, 3 and 4 star and the rest for reference purposes only. So the space I need on a trip for any amount of days is not high and can easily be covered by my macpro and an external WD 120Gb harddisk. Much more important to me is the possibility of doing periodical in between editing, hence the speed of the computer. I wouldn't think anybody would use a mac-air for image editing, but then I fail to see the purpose of a mac-air period. It's not uncommon for me on full-trip days to use the better part of 4GB, but I rarely go over 4GB, and even then tend only to approach it when I'm doing a lot of landscape work. This is with an original 1Ds, typical file sizes of about 10MB. You note that you tend to winnow images each evenings. There are certainly trips where I don't have the opportunity to do that, but if I did, I'd certainly be able to more than halve the load. I'm surprised by how much people fret about the cost of the storage involved. When I was shooting slides, I figure I was spending about 40 cents a slide including purchasing film, having slide processing done, and so on. An $150 8GB flash card can hold about 800 images from my current DSLR, which works out to half that. In other words, it might be argued that it'd be cheaper even if I never reused a flash card. Yes, I handwaved some of the numbers, but ... the thought that "disposable CF cards" might even be competitive with the cost of slides brings a whole new framing to the costs of digital storage for me. I'll typically shoot 3-4GB of RAW's on a day of serious shooting with my digital kit. However, my base system install is in the 60GB range after software and my Music library, and I'll usually take another 10GB of media files on vacation (something to do at night). So a 100-120GB drive is minimum for a mobile config for me (and indeed, my current laptop has a 120GB drive). I might be able to live with an Air if it was solely oriented towards a portable shooting system. But I use my laptop for multiple things, primarily as a midi station for my guitar preamps (Line6 POD 2.0 and Digitech 2120 Artist), as a stereo system (25GB of legit music), as a portable gaming system (EVE Online), as a portable TV/movie playback system (mostly Anime fansubs of stuff without NA releases) and shortly for school (Office 2k3 Professional and other software). The software installs add up rather quickly. Allowing 2 GB per day seems quite adequate! I'm an amateur with a Canon G7 and shoot a lot of concerts. Burst mode is a necessity if I want any hope of catching a few good shots. I run the camera in its highest quality (RAW isn't available) so I'm generating about 2.5MB per frame and easily take 400+ frames per show. I never delete on camera, so it's easy to fill a 2GB card. Vacations and travel are a bit different. I still run burst mode, but take more time to line things up the way I want. There it's about 1GB per day. The exception would be gardens which jump the frame count back up as I spend more time experimenting. Perhaps 5% of them are "keepers", but I never delete a single frame. All of it is carefully backed up to two hard drives and two DVD sets. Well first I'll just state that I am but a humble keen amateur..... now for some real examples. In the late 80's was the only time I ever managed four weeks away from home at a stretch, cycling across Spain - 10 slide films, pared the 360 down to about 250 keepers for the slide show. Finished the last film on the last day. On an average 2 week summer holiday I would take 4 or 6 films depending on likely photo interest of the destination. June 04 - 2 weeks in various French locations with a Fuji S2 170 shots 2.1 GB, only 40 shots made it to raw conversion. August 05 - 2 weeks in one French location with a Pentax *istD (which I almost miss) 96 shots 1.2GB, 33 shots made raw conversion. As an amateur, working on digital files while away from home is not an option I would want to explore - might miss some great evening shots! The post processing is for long winter nights. I'm now back to film for my main photography, though will admit to taking along a tiny Fuji E550 (shoots raw) for convenience. Personally I get more satisfaction (and better photos) by doing the editing in the viewfinder before pressing that button. For weddings, I shoot at least 30GB in a day. For a typical day of portraiture, between 10-25GB. For a typical vacation week, probably 20-25GB (for the entire week). On a trip to Turkey last fall, I shot more than 5000 high quality JPEGs with my 40D over 17 days (including travel days). That came out to slightly more than 2 DVDs, 18 GB, or 200+ images per day. On more than one day I was onto my second 2GB card, and I think the maximum was 500 shots in one day. I guess that averages out to 1GB/day, but I wouldn't feel comfortable with less than 4GB of cards in the camera/in my pocket. I took a portable hard drive, but it didn't like getting bumped around in my baggage, and died 2/3 of the way through the trip. Thankfully I was able to get all the images off if it onto DVD before it kicked the bucket. As an interesting note, I got the 40D just before the trip, and the storage for those 2-1/2 weeks was more than the storage for the previous 6 years (combination of film scans and a couple of P&S cameras). No body indicated how many images were printed, we are talking about image making aren't we? I shoot between 4 and 12 GB of RAW images per shoot with my 5D. That's usually in a 3 hour period. If I do a lot of post, my space requirements easily double. If I shoot every week, this can add up. Worst case, I'd need 20 GB/week, or over 500 GB per year. And I seem to need more every year... It could double every year if I'm not careful. That's a lot of DVD backups, and a lot of hard drive space. As a 4x5 shooter I consider myself it a lucky day if I shoot more than 3 sheets of film per day. Yet when I compare this to recent excursions with a digital camera where I return from a 2 hour shoot with a 2G card full, and then spend 2-4 hours sorting out the shoot. It makes me wonder. I wish I had the constraints that Matfiej describes, but unfortunately shutter lag consistently catches me out with moving subjects. Probably time to upgrade that digital camera, or not as Julian points out it could be time doing something else. I shoot 50 images a day, every day, all year long on my 400d, about 1/2 a gig. On a trip to somewhere special, this will go up to 4 gigs a day, but as someone said earlier, after several days of this, the eyes get tired of looking. Actually, it's not my eyes, it's my brain that tries to switch off: the eyes are still seeing shooters every instant they're open. I rejoice in the pennies per megabyte price of memory these days and shoot accordingly. Sifting through the day's shoot, I feel like a hawk on the wind as I look down upon the field of images and seek the digital protein that marks a keeper. I pretty much ignore the rest but don't delete a single image, and I revisit them after a time. "No body indicated how many images were printed, we are talking about image making aren't we?" Actually, we're not. At least not directly. We're talking about how much storage people need when traveling. The answer depends on how much you shoot and keep for later editing, not your ratio of keepers to non-keepers. - There's a noticeable cluster of folks whose consumption levels are similar to mine, in the range of 1 GB per day (or if one wants to be really picky about it, 1 GB per day per 5- 6 megapixels worth of camera). Not what I expected. - Even with this very limited pool there's a very wide range of consumption levels, ranging from less than a quarter of mine to as much as 15 times mine. We're seeing easily a 50-fold difference in storage requirements. And that's from folks using fairly similar levels of equipment; we're not hearing from the keychain camera crowd nor the folks with the five-figure medium- and large-format digital backs. If anyone ever needed convincing that one size does not fit all, this will probably do it. >' "Managing digital files on the move >sounds like a whole lot more work >than managing film." >Sure seems that way to me too, on >the rare occasions when I travel. horsefeathers. frame for frame, for comparable actions, film is no less of a hassle, and in some ways more of one. much of what some here are doing with digital simply isn't possible with film--we're processing and making dupes in the field, among other things--so that isn't more work than film, it's just work that we now have the option of doing in the field instead of after we get home. for comparable security, just don't delete your images from cf cards, and keep them reasonably safe. they're a good deal more robust than rolls of film, and far, far more compact--no need to leave them in your hotel if you don't trust it. if we copy images to an external drive in the evening, that's mainly an automated task that takes place in the bg while we work on email or whatever else you want to do: and now you have two identical copies of your files, something you never had with film. besides, have you tried international flying with film these days? talk about a hassle. i like film, and feel it still has some significant advantages over digital--probably will for some time. but i don't think it is easier (and it is more expensive, for me). I'm using a Canon 1D Mark II and on a given day, I will shoot about 20 GB of RAW images. However, probably unlike many of the people here, I do a lot of sports photography. Frame rate, another recent topic here, is also of great importance to me. I think if you were to ask the same question over at Sports Shooter you would get some markedly different answers.